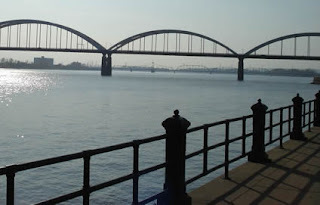 The Mississippi River is the longest river in North America. and become the most popular tourist attractions. The world's fourth longest after the Nile, Amazon, and Yangtze. The word Mississippi comes from the word "Mee-zee-see-bee" from the Ojibwe Indian tribe. This river's name means' big river 'or' father from the many waters ". From Lake Itasca Mississippi River flows into the nine states and ends in the Gulf of Mexico. If I counted 36 baseball one of the city through this river. The state is going through Minnesota, Iowa, Illinois, Wisconsin, Missouri, Arkansas, Kentucky, Mississippi, and Louisiana. Along the Mississippi River there are 241 species of fish and 326 species of birds. The longest bridge across the river is Lake Pontchatrain Causeway, in New Orelans, with a length of 38.35 Km. 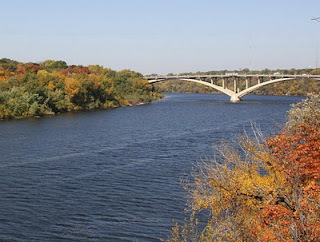 In the state of Minnesota, Mississippi River into the separator between the cities of Saint Paul, the capital of Minnesota, and Minneapolis. On both sides of this river there is a two way street with a maximum speed of 50Km/jam. There was also a pathway for pedestrian and bicycle paths. The parking is provided at the top of the river bank or in some low areas near the river. Most of the parking lot may only be used for two hours. On the river there is also equipped with a public park benches, chairs, and a place to cook (barbeque). This place is ideal for birthday parties or other family events. The other things that can do in here is fishing, canoeing, kayaking. People who have a boat, can also lower their boats into the Mississippi river. In the summer there are plenty of ships coming from the lower end of the river in the Gulf of Mexico and stop in Minnesota. Visitors to the Mississippi River should bring their own food because there are no shops along the river. In some strategic places provided lounger to enjoy the scenery. Some of these long chairs are donations from community members. Contributors may write their family name on the chair. Usually the donation is also intended to commemorate their family members who have died. Many people walk or run on the banks of the Mississippi River. Beautiful scenery and comfortable weather for the month of October.